"Based on the expectation of the Social Democrat council's decision to withdraw, perhaps the Seimas group could commit to support proposed legislative projects and the coalition government until the end of the Seimas session. 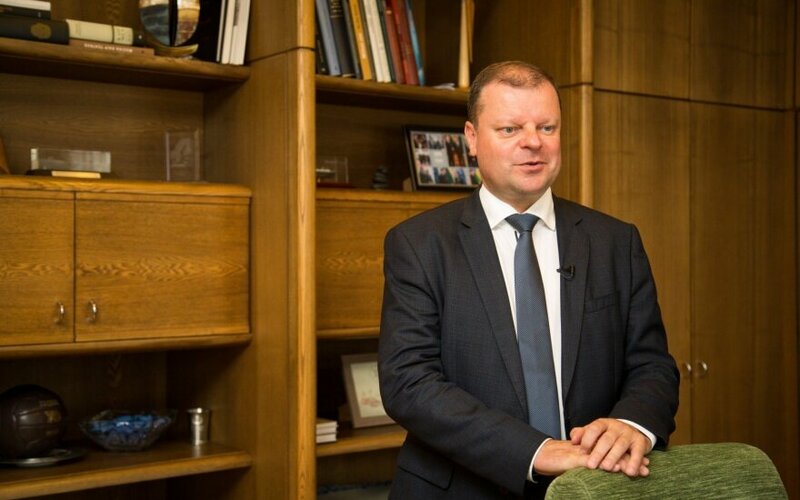 Such an approach is also possible," Prime Minister Saulius Skvernelis said, commenting on potential scenarios if the Social Democrats depart the coalition in autumn. That said, he has no complaints regarding the ministers delegated by the Social Democrats and does not dismiss the possibility that they could continue their work. This and other political issues were discussed on the talk show Dėmesio Centre. During the discussion PM Skvernelis stressed that it is not an option to wait for a Social Democrat decision, particularly when core legislation is at stake, as well as budget and tax changes. He points out that looking at the responses from Social Democrat branches so far, the picture is already somewhat clear, with 14 of the 18 branches that have voted supporting withdrawal. "By September 10 we must ensure support from at least 71 members of Seimas for the continuation of the government programme," Skvernelis said. The Prime Minister emphasises that he will talk with all the groups in Seimas in order to obtain support for the cabinet, ranging from the Conservatives and the Liberal Movement, to the Electoral Action of Poles in Lithuania – Christian Families Union and the Order and Justice Party. Skvernelis restates his negative views of the latter party, but points out that some of the party's group members are new in Seimas and he wishes to at least hear out their expectations and aims. 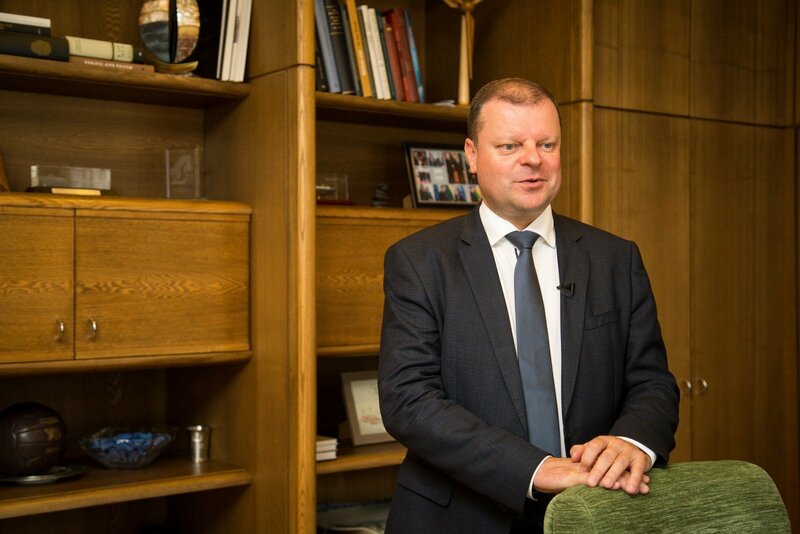 Regarding the ministerial cabinet and potential Social Democrat withdrawal, Skvernelis emphasises that the ministers have fulfilled the expectation of professionalism they were appointed with and even if the Social Democrats were to withdraw, the ministers the party delegated could continue working. Among other possible solutions to the current stalemate, Skvernelis points out that the Social Democrats could commit to support the cabinet's decisions up to the end of the autumn session, which could help remedy the ambiguous nature of current circumstances. While the government has applauded tangible successes in police reform, there nevertheless have been criticisms of the reform having been rushed through and left law enforcement officers with vastly increased workloads. S. Skvernelis stresses that while there are difficulties, nevertheless there has been progress, pointing to wages of 700 euro even for lower ranked officers. The PM explains that the government must continue encouraging such optimising reform and seeking further funding despite issues in communication and current workload difficulties. The reforms had stalled for a time, S. Skvernelis explains that this was done to fine tune details, with officers raising questions regarding new requirements. "The minister had to react and pause it. And this pause also gave results because the officers raised further questions. We are to do the following extra functions, we have to do everything from A to Z on site, but for this we need special machinery, transport, equipment and etc. If you want to establish new functions, you have to provide the equipment. This was done in parallel. Not to speak of consolidating general functions. One set of accounting, one materiel supply. This is a step toward consolidation," the PM explained. In terms of the education sector, S. Skvernelis explains that there is a need for structural reform for the sector as a whole, changing the wage payment system, adjusting school financing from "student baskets" to class composition, emphasising training and quality for teachers. Skvernelis points out that there were requests to dedicate 200 million euro for the sector, but he explains that currently such funding could be wasted through the sector's inefficiency, which first requires structural change, just that it takes time to implement and establish, particularly in seeking to avoid being challenged due to fiscal discipline legislation. The competition for the position of Department of Prisons head was won by Artūras Norkevičius, the Prime Minister's vice minister from his time as Minister of the Interior. Despite winning in the competition Norkevičius was nevertheless not appointed to the post. S. Skvernelis strongly denies having had any influence on the appointment not going through. He states that the Minister of Justice must have decided that the individual in question would be unable to achieve the breakthroughs needed in the prison system, with Skvernelis describing the situation in the sector as tragic and steeped in a near criminal subculture. Another competition for a senior position has come under question, with the State Department of Tourism having been unable to find a suitable head since spring, having announced a second competition for the position, just with reduced requirements. The 15min.lt portal points out that the conditions appear to be tailored for a specific person, Eglė Kudzmanienė who currently works in the Ministry of Economy and is also the wife of one of Seimas Speaker Viktoras Pranckietis' advisors. The State Service Department has objected to the presented conditions, albeit to no avail, leading to suspicions. The Prime Minister confirmed that the first competition failed due to the lacking qualifications of those seeking to be appointed, which made for an argument to reduce requirements, but if there are any indications of favouritism, he fully intends to intervene and ensure that there are no suspect appointments.